To implement a meaningful incentive system for your team, you need to select metrics that encourage the behaviors you need and the results you want. But first you have to decide what you need and want. Building better software does not rely on methodologies. "Following the process" omits important human factors that ultimately lead us to success. How can we meaningfully summarize—in a brief status report without losing important details—the successes and setbacks our projects experience? In part two of the series, Daniel introduces Google Web Toolkit's testing infrastructure and demonstrates how to build an Ajax application test first. 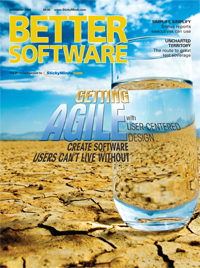 Agile practices go a long way toward providing value to our customers. But in today's market, we must endeavor to adopt a more user-centered approach to create products our customers can't live without. Excellent testing isn't just about covering the "map"–it's also about exploring the territory, which is the process by which we discover things that the map doesn't cover. Keeping QA members up to date on changes as they happen–through meetings, wikis, and email–can reduce the number of unnecessary bug reports and save you time and frustration. Encapsulation is more than just using the "private" keyword when defining a class. You need a boundary that keeps the vampires out.